Bret Anthony Johnston’s first book, Corpus Christi: Stories, was named Best Book of the Year by The Independent and the Irish Times. 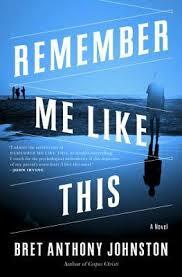 His new novel, Remember Me Like This, tells the story of a boy who disappears in Corpus Christi and then mysteriously turns up. Johnston is the author of Corpus Christi: Stories, which was named a Best Book of the Year by The Independent (London) and The Irish Times, and the editor of Naming the World and Other Exercises for the Creative Writer. He currently serves as Director of Creative Writing at Harvard University. In this interview, Johnston discusses suspenseful imagery, the challenge of finding the right tone, and his approach to place in fiction. To read an excerpt from Remember Me Like This and an exercise on setting the mood in fiction, click here. The novel begins with a body facedown in the water. This image doesn’t return until almost the end of the novel. In fact, it’s almost possible to forget about it since it’s not long before the drama of the novel takes over. What went into your decision to open the novel with that image? Did you worry that the reader would become impatient with wanting to return to it? My hope was that the image would embed itself in the reader’s subconscious memory, that it would be something of a shadow that followed them through the story. I wanted them to wonder about the body; I wanted it to keep them from getting too comfortable in the story, to preclude them from taking survival for granted. That is, I wanted them to share the experience that the family endures. Starting the book that way seemed to invite a necessary kind of empathy. Of course you’re right, though, in that it’s almost possible to forget about the image. That’s the gamble I had to take so that when the body returns, the reader is jolted and yanked back toward a kind of raw vulnerability. I hope it works. If it didn’t, don’t tell me. The scene where Justin appears for the first time is really well done and uses a deft trick of misdirection. I can imagine that scene was difficult to write. The readers been waiting for it intently, and so there’s a need to both meet and confound their expectations. How did you approach that scene? Your reading of the scene, the craft behind it, is incredibly accurate and I really appreciate such close reading, Michael. Thank you. What you’re pointing out, though, actually came with relative ease—meaning, it was stunningly difficult and time-consuming, but still not as difficult or time-consuming as other scenes—because it was the result of empathizing with the characters. I only had to understand what the characters would be feeling in that moment, and because I knew them well by that point in the book, their reactions were readily available. Once I understood that she would fixate on her memory him being afraid of snakes, I felt really at home in her reaction. What took an enormous amount of time was striking the right balance in what might be called tone. I revised and revised and revised to get the scene to move evenly toward the revelation. I struggled with the pace for many drafts. I struggled with the cop’s reaction and the district attorney’s entrance. As you say, it was a scene that we were all waiting to see—not least the writer and the characters—and I took care not to speed through it or linger in an indulgent, self-defeating way. One of the pieces of advice that I regularly dole out to my students is to engage the opposite emotion of what the reader would expect, and I relied on that here. The expectation, I thought, would be hopefulness, but I didn’t think these characters had much hope left in them. I saw that as an opportunity, a way in. The novel returns to certain places (the empty pool at the “half-razed TeePee Motel” and the Marine Lab). The places begin just as places where the characters go, but over the course of the novel, several of the most important events occur there. Did you have certain dramatic scenes in mind when you first introduced those places into the novel? Or, did you explore the places and return to them until the drama presented itself? The latter. When I start writing anything, I have no intentions of any kind, and the novel was no different. I approach every piece of fiction the same way, which is to pay attention to the details, images, and artifacts of the story and take nothing for granted. My impulse is to reach backwards in a story rather to stretch forward, so I’m always asking myself what’s already in play that I can use again, that I can recycle in a manner that will reward the reader’s attention. It’s a mechanism of repetition and evolution. In this case, I returned to various places until those places evolved to mean something other than what they had. I think a lot of new writers are excited by the prospect of constantly bringing in new material, new imagery or settings or objects, but I think the more satisfying move is often to juggle what you already have so that the reader sees something familiar in a new, more revelatory light. It’s been ten years since Corpus Christi: Stories was published. Since then you’ve continued to write stories, and you’ve also published a book of creative writing exercises and written a film documentary about skateboarder Danny Way. Plus, you direct the writing program at Harvard. In other words, you’ve been pretty busy. And yet, I can imagine there was pressure to produce a novel, especially since your first book was so well received. How were you able to resist that pressure, to discover the novel you wanted to write and then write it at a pace that would allow it to become the book you had in mind? You’re absolutely right about the pressure, but I regard any kind of pressure as a privilege. I’m incredibly fortunate to have editors and readers who want to read my work, and I refuse to take that as a given. Honestly, it still surprises me. It really does. It surprises me to the degree that I don’t fully believe anyone when they ask to read something I’ve written; I think they’re just being nice. And yet it’s always been clear to me that I’m a slow writer and there will be years between the books that I’m lucky enough to publish. Meaning, I don’t want to publish something until I think it’s ready, until I’ve written the book I want to read, because it will be a long, long time before I have the opportunity to redeem myself. What this means is that I’ve missed many deadlines. I know I missed at least three for the novel, though maybe I missed more. The book just wasn’t ready, and publishing it would have seemed a kind of malpractice. I always gave the publisher the opportunity to cancel my contract, and I apologized profusely, but I also wouldn’t show them the book until it was ready. I worked with an amazing editor named Kendra Harpster, and she was beyond supportive. Not only would the book not have been published without her, the published book wouldn’t be nearly as successful without her guidance. It’s another way that I got lucky. I’ve been lucky my whole career. Lucky and slow, that’s my life as a writer. I wouldn’t change it for the world.